People with lung problems like asthma, chronic obstructive pulmonary disease (COPD) or bronchiectasis are usually given inhalers as part of their treatment plan. These videos from the National Asthma Council of Australia show the right way to use several types of inhalers. You can use many types of inhaler on their own or with a spacer that makes breathing in the medicine easier. Newer inhalers are often designed to be easy to use without a spacer. A spacer is a plastic device that you use with an inhaler. Spacers help to deliver significantly more medication into the lungs than using an inhaler alone. Everyone can benefit from using a spacer, not just children. Children who are too young to use a mouthpiece use a small volume spacer with a mask. The colours of inhalers have changed recently. Doctors now prefer to call the inhalers by their names rather than their colours. Read the data sheet that came with your inhaler for details of how to use it. If you don't have a data sheet, you can find one on the Ministry of Health website Medsafe. Click on I want to... find a medicine data sheet in the panel on the right, then type in the name of your medicine and click Search. 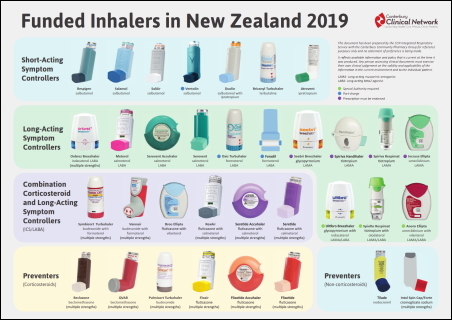 Click the image to the right to see a larger version of a poster showing the inhalers that are available in New Zealand. There are several types of inhalers. The most common type of inhaler used is a reliever inhaler. A reliever inhaler contains a medication called a bronchodilator, which relaxes the muscles in your airways. This opens them up to allow more air to flow. You usually use them when you feel wheezy or short of breath. You can also use a reliever inhaler before exercising to prevent wheezing. Examples of short-acting relievers include salbutamol (Ventolin), ipratropium bromide (Atrovent), and terbutaline (Bricanyl). If you need to use your reliever inhaler often (most days or several times a day once or twice a week) it is important that you see your doctor to look at other treatments. You should always have your reliever inhaler with you in case of an asthma attack or COPD flare-up. Inhaled steroid preventers reduce the inflammation in your airways and make an asthma attack less likely to occur. They are also sometimes used with COPD. You usually take inhaled steroids preventers once or twice every day. Examples of inhaled steroid preventers include beclometasone (Beclazone or Qvar) and fluticasone (Flixotide). Single inhaler therapy is a fairly new approach to treating asthma. Some combination inhalers (see below) can be used both as a reliever and a preventer. The main advantage of this is convenience of use. Often it also controls asthma better. Only Symbicort and Vannair (formoterol plus budesonide) can be used in this way. Other combination inhalers such as Seretide, Breo and Rexair can't. Combination inhalers contain both a long-acting reliever and an inhaled steroid preventer. You need to use this inhaler every day. Examples of these medications include formoterol plus budesonide (Symbicort or Vannair), salmeterol plus fluticasone (Seretide or Rexair), and vilanterol plus fluticasone (Breo). Long-acting relievers help to keep your airways in a relaxed open state. Examples of long-acting inhalers include salmeterol (Serevent), tiotropium bromide (Spiriva), and formoterol (Oxis). 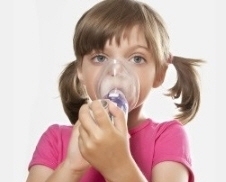 This page has information about inhalers. It includes a video showing children how to use their own inhaler. These videos show how to use several different types of inhalers and how to use a spacer. This YouTube playlist has videos of inhaler techniques for several different types of inhalers. It has videos in English, Farsi, Korean, Mandarin, Cantonese and Filipino.